When you deal with freight, there will always be some shipping issues that are out of your control. You can’t stay with your freight throughout its whole journey, and there are a number of sticky situations you might find yourself in. However, if you know how to prepare for some worst case scenarios, you can position yourself to bounce back quickly. One of the most common disruptions that can cause shipping issues is the weather. Storms and other severe weather patterns can have a significant impact on a carrier’s delivery network. When one area is hit, it creates a ripple effect that’s felt all over. Especially during hurricane season and the winter months, it’s important to keep an eye out. However, even in milder months, you can’t let your guard down because Mother Nature can be unpredictable. If possible, give yourself a buffer zone for transit time. Build in extra days, especially for time-sensitive shipments. That way, if a storm hits and your shipment gets delayed, you’ll still be in the clear. It’s also a good idea to work with a broker to gain access to additional resources in a pinch. You’ll be able to expand your carrier network and lean on them when capacity is tight. Criminals targeting your freight are getting savvier and are constantly finding new ways to hit shippers. Dealing with cargo theft is a nightmare, and it can happen to anyone. Especially if you’re shipping electronics, raw metal materials, food items, pharmaceuticals, or other highly targeted commodities. Thieves are not only surveying ship yards for arrival and departure changes, but are also engaging in sophisticated scams. Some are posing as transportation companies, using counterfeit documents, or working an inside job. To be proactive against cargo theft and the shipping issues that go with it, there are a few simple things you can do. Ensure your driver is using a locking system that includes a variety of locks, from king pin locks, air brake valve locks, and glad hand locks. Using GPS tracking is also a good tactic to keep an eye on your freight and make sure it’s where it’s supposed to be. Overall, it’s important to carefully select transportation providers and warehouse staff. Every time you turn on the news it seems like there’s a new cybersecurity issue. Unfortunately, the shipping industry isn’t immune. The technology that is on trucks nowadays can leave them vulnerable to ransomware and malware that could shut down the vehicles and put your freight at risk. Cyber attackers could potentially be targeting your freight for theft or could be looking to shut down a carrier’s service in hopes of securing a ransom. The risk of a cyber attack affecting your freight right now is slim, but cybersecurity issues are becoming increasingly prevalent across all industries. While prevention is more in the hands of your carrier for cyber attacks on trucks, staying educated and planning ahead is key. Create a plan that details what you would do in the event your freight gets caught up in the middle of a cyber attack. That way the contingency protocol is clear and you’ll have resources readily available. Dealing with damaged freight involves a lot of heartache. Not only are you out your product, but you also have to deal with the nightmare that is the claims process. You may experience damages that are visible upon delivery or damages that are concealed, meaning they aren’t discovered until after delivery. Luckily, as far as shipping issues go, this is one you have some element of control over. Preventing freight damage starts with proper packaging. If you’re the shipper, don’t be afraid to spend a little extra cash upfront to ensure you’re not spending more after the fact. Be conscious of the weight capacity of your chosen container and invest in quality materials. Then choose packaging that is sized right – with just enough room for the contents and the necessary impact protection. If you’re palletizing your shipment, make sure your items sit squarely on the skid with no overhang. Weight should be evenly distributed with heavier boxes on the bottom, and everything should be completely secured to the skid with banding, stretch-wrap, or breakaway adhesive. If you are receiving the shipment, make sure you’re following the proper procedures for accepting freight. Inspect your freight immediately and notate any damages on the delivery receipt. File your claim as soon as possible and make sure you have all the necessary documentation. Any small misstep can lead to your claim being denied, so it’s critical that you’re thorough. 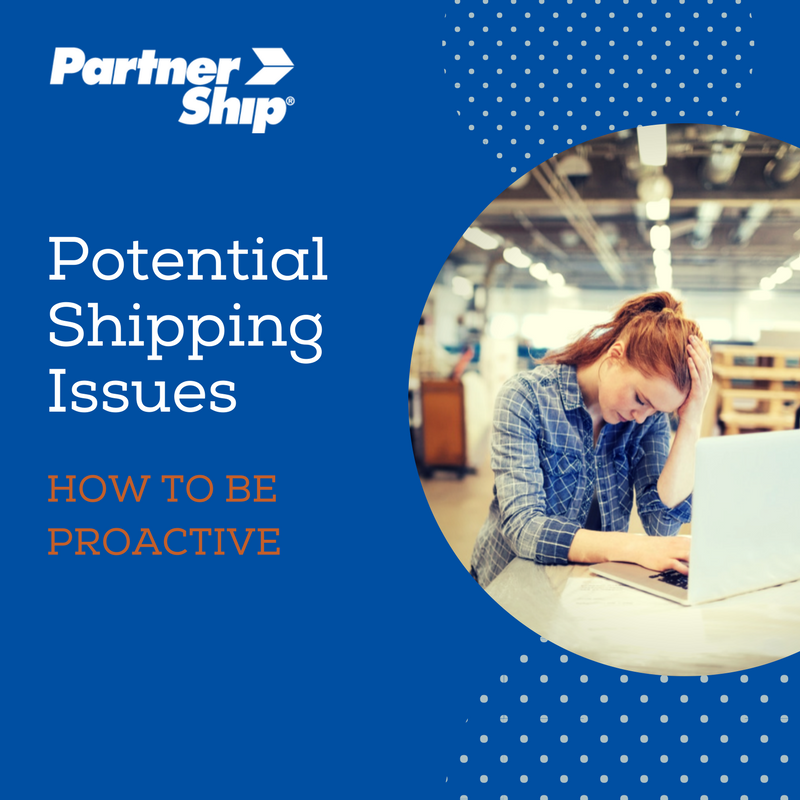 Some shipping issues will be beyond your control, but that doesn’t mean you’re completely out of luck. By educating yourself and being prepared, you can mitigate the impact. The shipping experts at PartnerShip have seen it all, and we’ll help you navigate through the toughest issues. Want to learn more about how to tackle freight challenges? Check out our latest white paper!